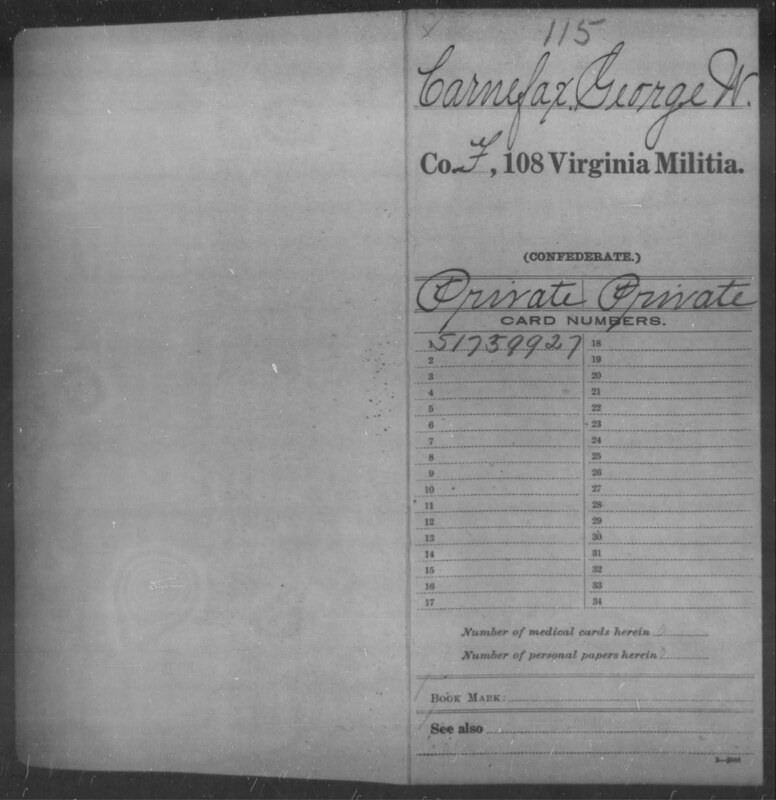 Very little is known of George Carnefix's military service in the Civil War, other than what we find here. 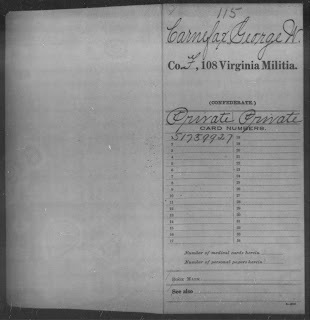 We know he served as a Private in the Virginia Militia's 108th in Company F.
His name appears on a roll of names of individuals who received payment. And again, he served as a Private. George Carnefix was married to  Susan Elizabeth PATTESON about 1852 or '53. Susan died between 1858 and 1860. And on 02 May 1860, George married Mary Susan Daugherty of Monroe County. 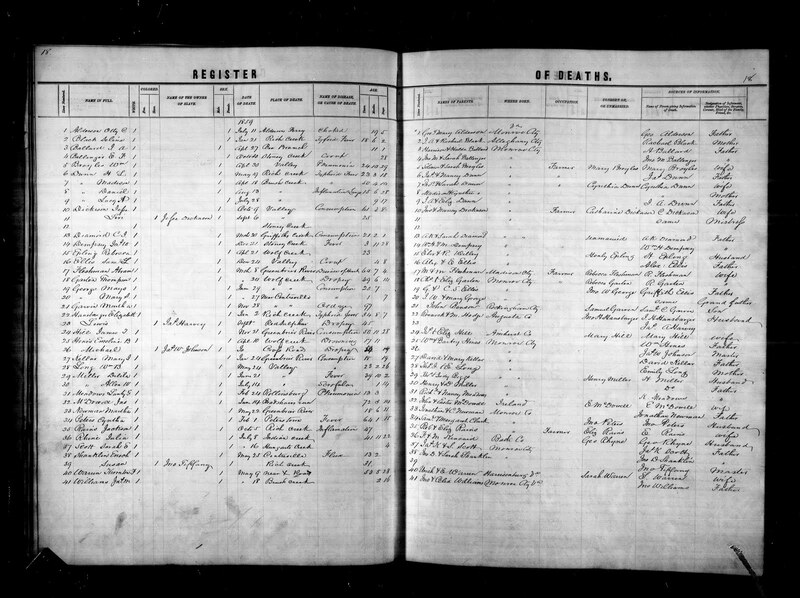 George and Mary had one daughter, Elizabeth, born in 1861. George is one of the individuals believed to have died in the Battle of Cedar Creek, Virginia on 19 Oct 1864. He never returned home. 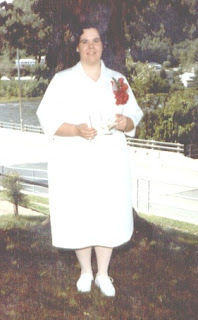 Susan later married Jacob Wickline. With our next family reunion coming up in August, I thought you'd all enjoy seeing a group shot from our last reunion in August 2009. Yet another stone from the Bean Family Cemetery located near Waiteville, in Monroe County, West Virginia. Today we will discuss yet another possible burial. That of William and Rachel's grandson, William B. Long. William B. LONG was the eldet son of Thomas J. and Emily [Bean] LONG. Born 1834 in Monroe County, Thomas died at a very young age, on 24 May 1859, at his parents home on Back Valley from "Consumption" [the popular term for tuberculosis at the time]. It is believed William was never married and had no children. ...gives us no indication as to where he was interred, only that his mother reported the death. Sme say he was probably buried here, as the first known buials had taken place shortly less than three years prior, with the death of Emily's mother, Rachel, and sister, Nancy. It only made sense to lay her son next to close family members. However the trek from Back Valley to Waiteville would have been a long one by wagon, and was in May, whenthe weather was warmer. Some say that due to the naure of his death [tuberculosis], there would have been a speedy burial closer to home so as not to spread the contagion. It is my belief that these individuals were little aware of just how contagious the disease was at the time, as no separation had been made nation-wide at this early state for individuals stricken with the disease. It is my belief we should postulate more toward the former speculation rather than the latter. The stone, as seen above, remember, is not identified in the cemetery. No one today remembers where any individual lies in the cemetery. Only these broken, fragmented and lichen covered stones, with no visible engravings remain. The stone above is clearly a grave marker, and was once qute thick compared to some of the others. One can see the traditional lines of a tombstone, but again, there are no visible engraving to identify the occupant of this grave. We received your letter day or so ago was glad to hear from you. Well Elner is coming home to stay this summer and we are glad of it. Marg was operated on for appendicitis last Monday 1 wk ago today Come out from under either O.K. haven’t heard from her since. Corn over the 2nd time and it is looking fine. They are all well they asked so much about you. Saw Codine at Waiteville the other day She isn’t married She is going to Charleston to business school this summer She said the Lewis boy is still going with her. Ralph McCormick has T.B. and is in Beckly Sanitorium Uncle Jacks are awfully torn up over him. 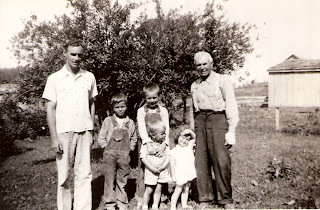 William [Bill] Beane, Edsel Beane, Walter [Buster] Beane with his arms around litle brother Roy Edwin Bean, Betty J. Beane [2-yrs] and John M. Bean, Sr.
John was the fathe of Bill, Edsel, Walter, and Roy Edwin. 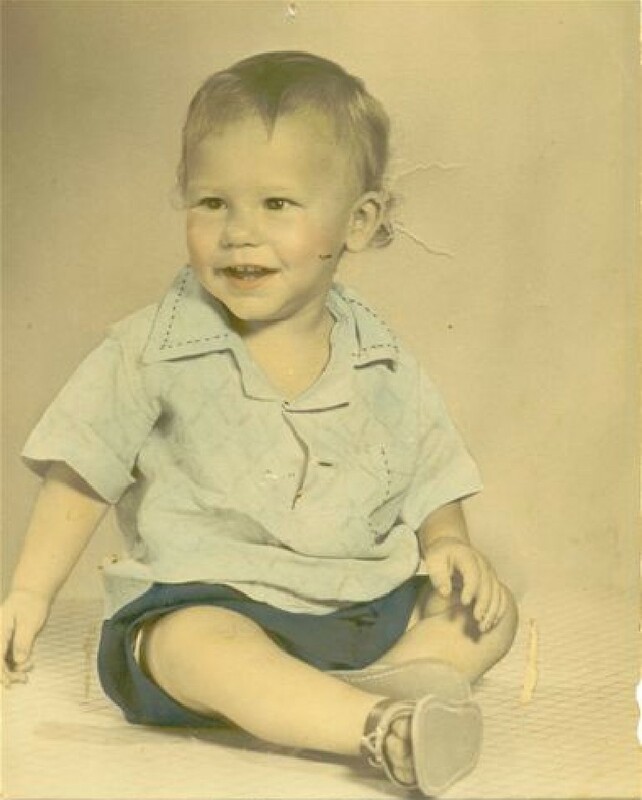 Betty Jane is his granddaughter from yet another son, John Jr.
What was the #1 song during the week of your birth? Enter your birth date at This Day in Music (http://www.thisdayinmusic.com/birthdayno1) and find out. If you were born before 1946, you can enter the year of your marriage, the birth dates of your children or some other significant event. Or on your birthday when you were 15? Please see previous post for results. They are the same. Hey geneaphiles - it's Saturday Night, time for more Genealogy Fun!!! Tonight, we're going to go down memory lane a bit. 1) What was the #1 song on the day you were born? Or on your birthday when you were 15? Or when you married? Or some other important date in your life. 2) Go to http://www.thisdayinmusic.com/birthdayno1 and enter the date and select from UK, US or Australia record lists. Note: the first date available is 1 January 1946. Alternatively, go to http://www.joshhosler.biz/ and enter the month and date and see a list of songs for each year since 1940. 3) Tell us what your results are (If you are sensitive about your age, don't list the date or year... ) on a blog post of your own, a comment to this post, or in a Facebook status line or note. Heading on over to web-stop number two I put in the appropriate date and was given the same song!!! From web-stop #1: My Heart Will Go On by Celine Dion. Now that is one heck of a song!!! From web-stop #2: Once again consistency! The same Celine Dion song, My Heart Will Go On. Thanks Randy for this special walk down Memory Lane. I'm sure I can speak for everyone who accepts this challenge, that we thoroughly enjoyed this special visit to the past! Memories came flooding back, and I had a blast! Now, if I could just get Bobby Darin's singing out of my head, I could probably concentrate on a little genealogy this evening! 9526 15th Bay Street, Norfolk, Virginia. 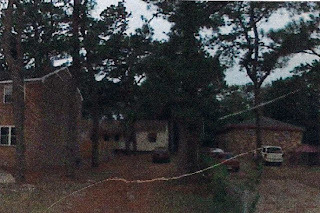 Some of the huge pine trees have been removed since we lived there, and the front porch has been closed in and made into a room. The outside stairs were not there when we lived there, either. 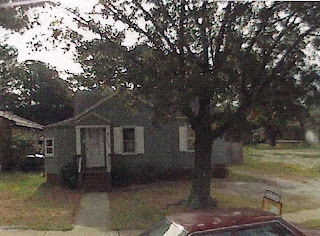 Most of my earliest memories are in this house! 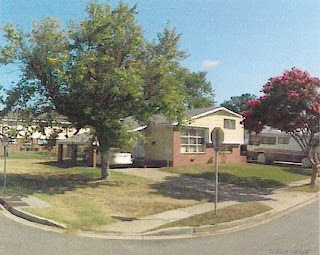 9562 12th Bay Street, Norfolk, Virginia. We moved here because we needed another bedroom. My Grandma Bean moved in with us that year, and at the last house, she was having to share a room with my sister and I. Here she was given a modicum of privacy with her own bedroom. This house had proper grass for the yard! And a HUGE back yard for the two of us little girls to play in! ...4600 Krick Street, Norfolk, Virginia. It was here that I entered my teen years, had my first kiss, and have the most of my memories from childhood. In 1973 we moved to West Virginia. And I married a just two years later for the first time. But that.... is a story for another day. Today we'll take a look at another of Texican's family lines, the Surber's. Johnnie Lee HENRY was bornin San Antonio, Bexar Co, TX. He was the son of 2.Joseph Wright HENRY and 3. Betty Louise Rotge. 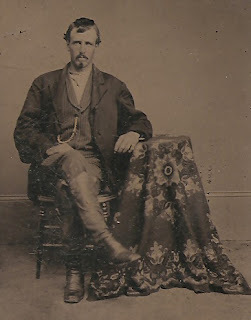 He married Cynthia Ann BEANE in Covington, Alleghany Co., VA, daughter of Walter Maxwell BEANE and Lois Velleda DREHER. She was born in New Albany, Floyd Co., IN. WATKINS. He married Reuhama YOUNG before Dec 1831. 53. Reuhama YOUNG was born Abt. 1811 in Washington County, Virginia. Kentucky. She was the daughter of 210. George WATKINS and 211. Ann REED. Kentucky. He was the son of 416. Henry SURBER. He married Margaret wifeofAdamSurber. 1754 in Frederick County, Virginia. Week 24. Clothes. What types of clothes did you wear as a child? What was “in fashion” and did your style compare?. What types of clothes did you wear as a child? What was “in fashion” and did your style compare? Okay, can I say, officially, this was probably the most fun I've had in a while with the challenges!!! Let's begin at the beginning! I would suppose as far as diaper-wear was concerned... 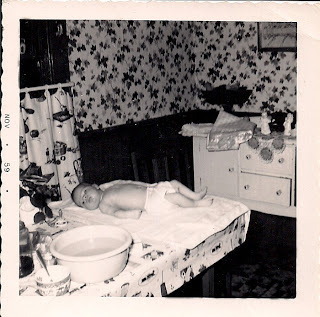 I was dressed as fashionably as any other 1950's baby! 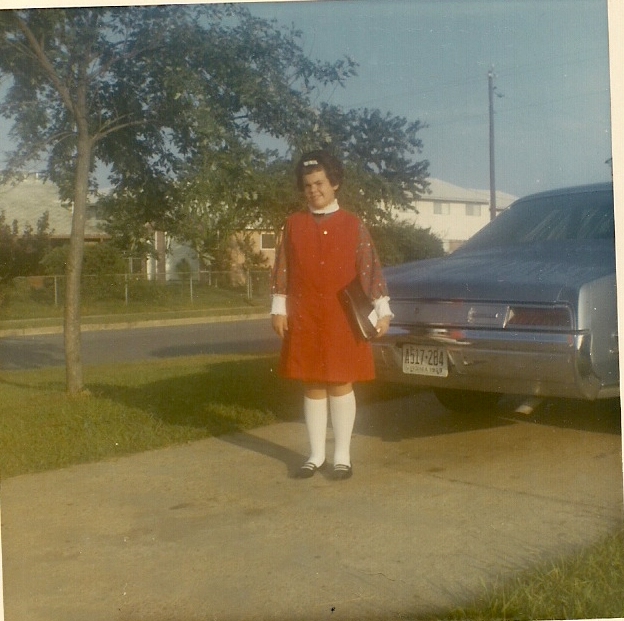 Eventually, of course graduating into some real clothes, I have to admit, Mom dressed me stylishly! 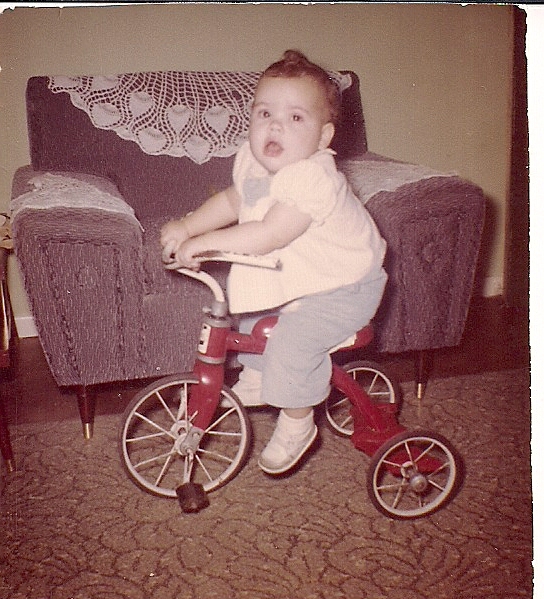 Here I am in the official 1950's era biking outfit for little tykes! How cute is that? Tea parties, of course, required more formal wear. And a garden party dress was indeed in demand! Here Dolly and I share our tea time together at a table reserved just for us! 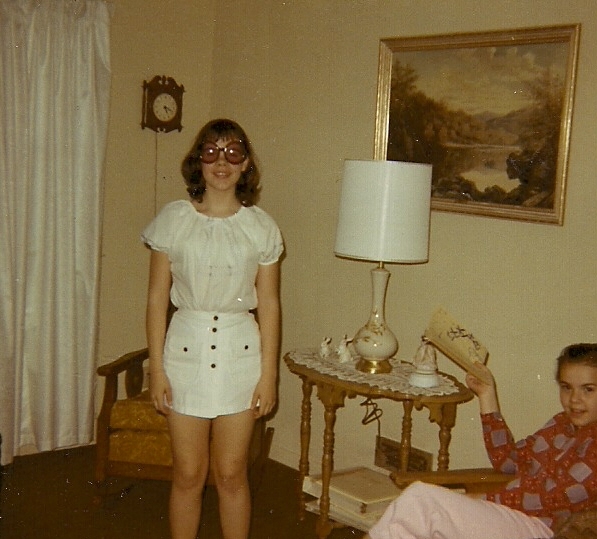 As I got a little older, I did begin to notice what my friends were wearing and demanded to be dressed according to the fashion statements of the times. T-shirts were rarely seen in those days, except as under garments. 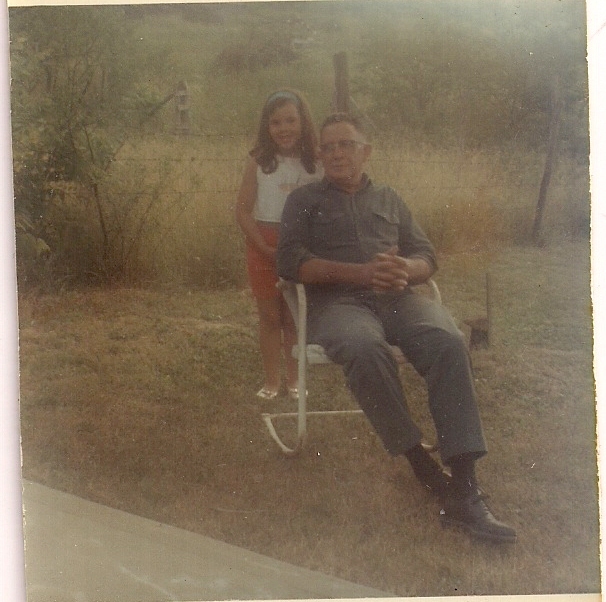 Here I am, with my beloved Grandpa Dreher, in a stylish two-piece ensemble consisting of matching shorts and sleeveless top. Perfect for those summer outings, when we visited with family in Indiana! 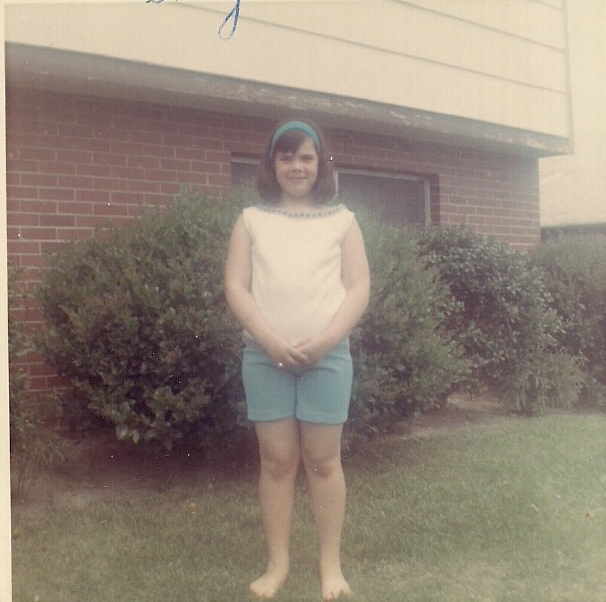 The same year, at home, in a matching turquoise shorts ensemble. Complete with matching headband. 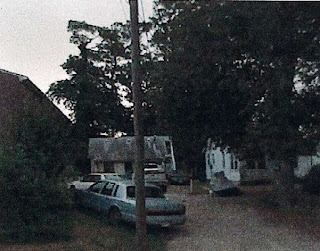 This was in front of our home in Norfolk. I remember this outfit well. It was actually one of my favorites, as what appears to be a jumper with a blouse underneath, is actually a jumper with a dress beneath. They could be worn seperately, or together as shown here. 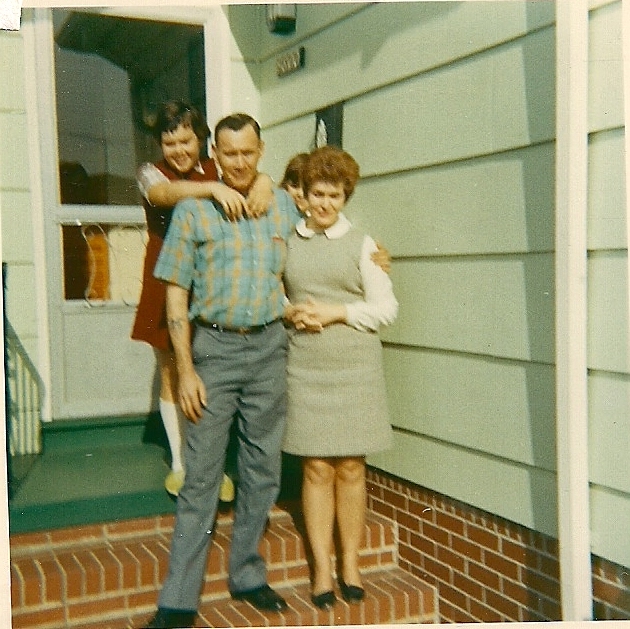 The next year, I am seen here with my Dad, and my cousin Betty Jane. 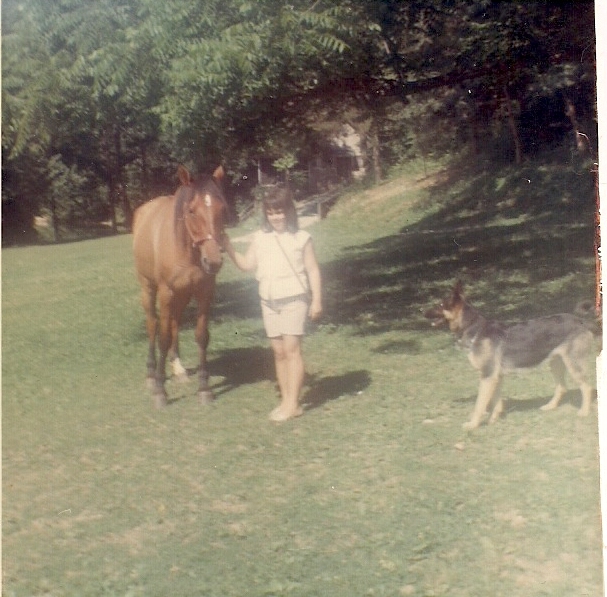 You can just make out that I am wearing a maroon colored wool jumper with a mdaras plaid short-sleeved blouse. Note my ever present knee socks! The following summer, on the farm in Corydon, Indiana, where my Grandparents lived, with the horses and dog. Two years later, and we were entering 1970. Note the long lean look! Matching outfit still. I was still curling my hair, and trying to look hip. We actually began wearing t-shirts around the house at this point! And a year later... I am into the mini-skirt and peasant blouse look! [That's my little sister on the side, critiquing my new outfit!] I thought I was so cool, and looked "groovy man!" And yet, the next year, I began maturing. While "hippie" clothes were okay for around the house, Mom insisted on looking proper when we went out! 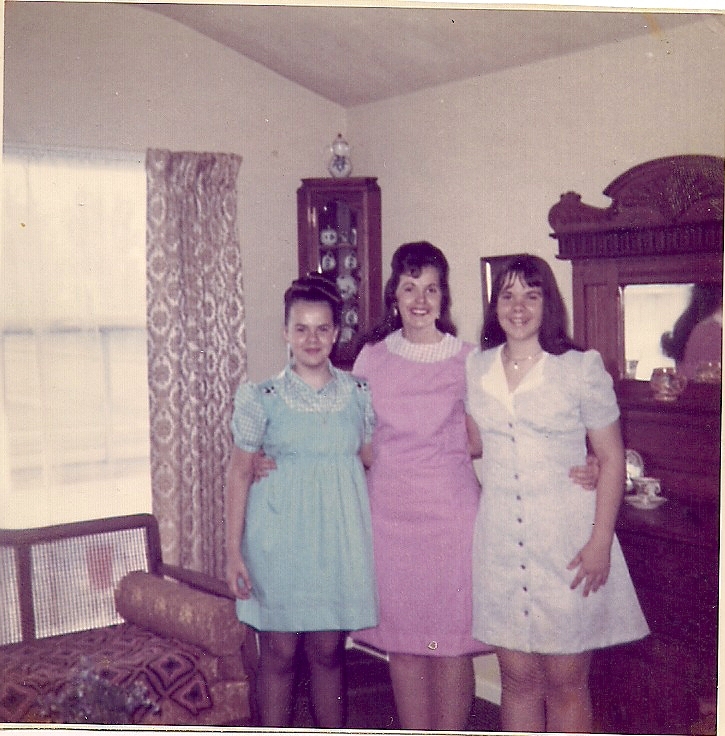 Here I am [far right] with my Mom [isn't she gorgeous? ], and my sister [Eydie], before church one Sunday morning. Mom had made her own and my sister's dresses. Aren't they charming? Mom made many of the clothes we wore. As a child, and a teen, I was wearing the same styles of clothings as my contemporaries. And then continued until I finished school and was married. 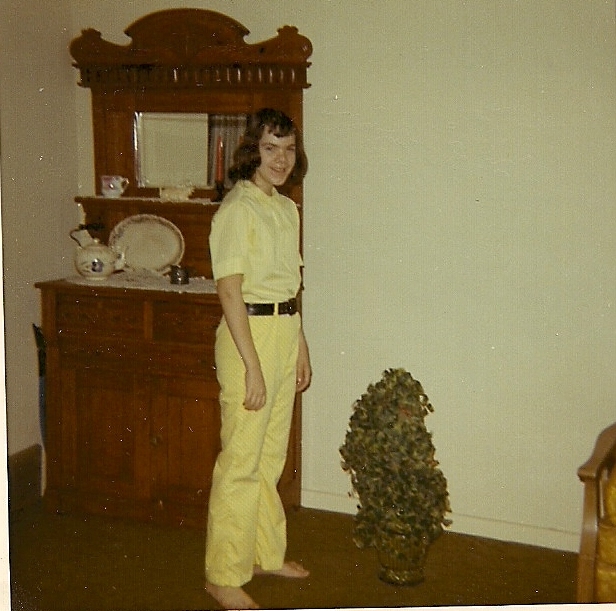 I later went through many phases, and my clothing often reflected where I was at emotionally at the time as well. The happier I was.... the more time I took with my appearance. 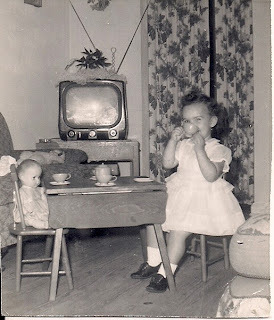 I loved going through these old photos! Seeing the clothing styles, and remembering the days! 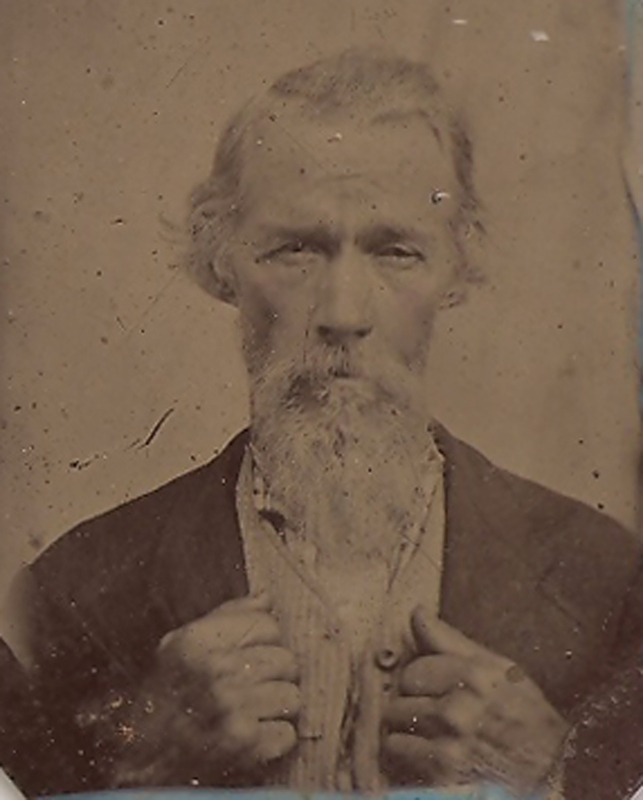 The son of William M. BEAN and Rachel WISEMAN BEAN, Archibald was born 06 Oct 1826 in Monroe County, [W] Virginia. In 1849 he married Amanda SHIRES, who is believed to have died in childbirth in 1850 or 1852. They had two possibly three children. 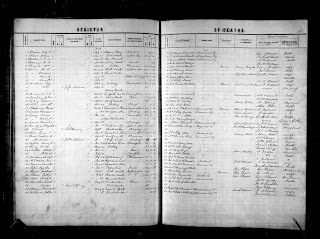 In 1853, he married Margaret Ann DUNBAR, and they went on to have nine known children. Archibald's children traveled far and wide, some settling in Oklahoma, and others as far away as California. Archibald died 31 Aug 1899 in Kanawha County, West Virginia. He is buried in the Teays Hill Cemetery in St. Albans. Today we will continue with the Bean Family Cemetery, located across the road and upon a knoll from the old Bean Homestead, near Waiteville, in Monroe County, West Virginia. Today's stone is, as the others were, plain, unmarked and broken. It sits at the head of a sunken grave. Most of the graves in this cemetery are clearly dinlineated by the sunken shapes. These are roughly 6-8 feet long by 4-foot wide. And for the most part, the graves are sunken 8-10 inches. This stone is lichen covered, and is very brittle. Easily chipping when one attempts to peel the lichen away when looking for markings. Because, as previously noted, we do not know who is buried where in this cemetery, the stones we are focusing upon are merely symbolic on the names we are assigning them. Today's stone we will assign to a woman we know very, very little about. Amanda SHIRES was born about 1826 to John and Margaret HAND SHIRES. She was one of at least two known children born to this couple. On 01 Jan 1849, Amanda married Archibald Marmaduke BEANE [1826-1899], the son of wealthy landowner William BEAN and his wife Rachel WISEMAN BEAN. It is believed that Amanda may have died in childbirth with the last child. It is also possible that Amanada Alafaire and Alafore are one and the same individual. Death and Birth records did not appear in this county during the years when either of these events would have occurred. It is long held family tradition that Archibald buried Amanda on the Bean property at the family cemetery. Archibald went on to marry, in Dec 1853, Margaret Ann DUNBAR, whose grandparents were influential in the founding of the county. They then had nine children together. No other information is known about Amanda Shires Bean at this time. were joined together in matrimony January 3, 1828. 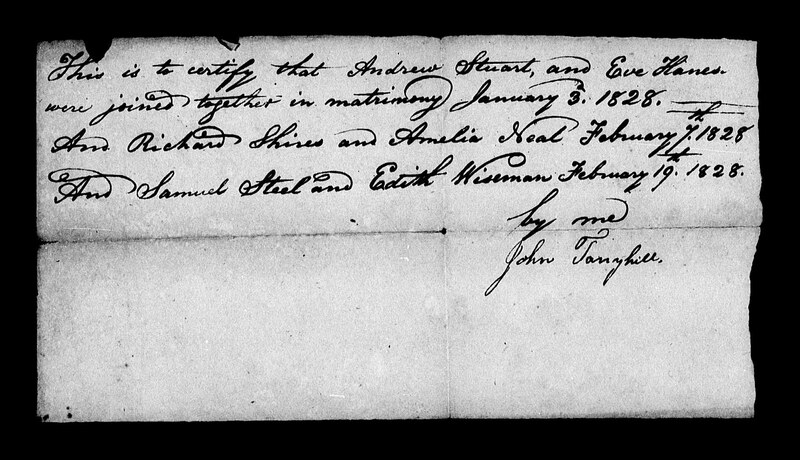 And Richard Shires and Amelia Neal February 7th, 1828. And Samuel Steel and Edith Wiseman February 19th, 1828. NOTE: Edith Wiseman was the daughter of Joseph Wiseman and Elizabeth Bateman Wiseman. She was the sister of my great-great-grandmother, Rachel Wiseman Bean. Pre-heat oven to 425-degrees farenheit. Mix together dry ingredients. Add milk, egg and melted shortenig and mix well. 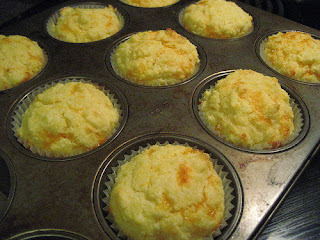 Pour into prepared oven tin and bake until golden brown, about 17-18 minutes. Serve while hot with melted butter. 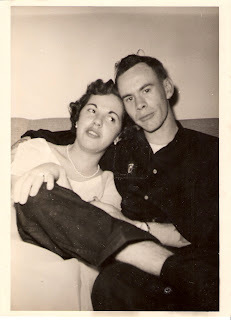 My Mama and Daddy, just a few hours after they were married at the Presidio in San Francisco, California, 1958. We have thusfar, on Tombstone Tuesday reviewed four of the known graves in the Bean Family Cemetery, located near Waiteville, in Monroe County, West Virginia. We have named William Bean, his wife Rachel Wiseman Bean, their daughter Nancy Bean, and another daughter, Emily Bean Long. Today we will add yet another name to ou list. That of Emily's husband, Thomas Long. But first, let's remind you that the stones you see have no visible markings for their graves occupants or identification. As such, we are using these stones to symbolicall represent the individuals we are reviewing. The stones you see are very much headstones in the actual cemetery. But time and age have lost their identification markings. And there are no living individuals who can point us directly to who lies within each grave. The stone you see here is fragmented, and is rectangular, upright in appearance. It is definitely a crude, chiseled stone. Areas appear to have been flaked away to shape the stone. It does lie at the head of a large burial indentation in the ground. It appears to be an adult sized grave. There are no markings left visible to assist us otherwise with this stone or its occupant in the grave. Thomas J. LONG was born 1810 in Culpeper, Virginia to Brumfield LONG and Letitia ROACH. He was the eldest of at least five known children born to the couple. On 03 Sep 1833, Thomas married Emily BEAN, [1814-1889] the first-born child of William BEAN and Rachel Wiseman BEAN. Thomas was 23 and Emily was 19 at the time of their marrage. Thomas died 15 Apr 1888 while living on Dropping Lick. He was 78 years o age. He is believd to have been buried in the Bean Family Cemtery, located across from the old Bean home near Waiteville, in Monroe County. This little fellow was often called "Jack" when he was a small shaver by his endearing grandpa. No one else called him by that name. And few even know about this na today. I call him the Texican. Now do you know who it is??? None other than my sweetheart, my hubs. Johnnie Lee Henry. Son of Joseph Wright Henry and Bettie Louise Rotge. My great-great-grandfather was named Joseph EVE. He was married to a woman named Annette. And that's all we know about her. Perhaps if you are reading this, and know the family, you would be kind enough to pass on any information you may have regarding this unknown woman who was the mother of my great-grandmother. of 2. Walter Maxwell BEANE and 3. Lois Velleda DREHER. She married Johnnie Lee HENRY in Covington, Alleghany Co., VA, son of Joseph Wright HENRY and Betty Louise Rotge. He was born in San Antonio, Bexar Co, TX. 31. Annette was born 12 Feb 1840 in Indiana. She died 01 May 1870 in Indiana. ***Thank you one and all for your consideration in sharing any known info on this family! One thing I learned from he first year we moved back to West Virginia, when I was only thirteen years of age, is that a man [or woman!] need never go hungry in this State! One of the first meals Mama ever made us once we were settled was Fried Poke. This is a poke plant. It's the green shoots that you want for this particular dish. And man-oh-man... you haven't eaten until you've eaten fried poke!!! Take the young green shoots and cut them into about 3-inch lengths, splitting them seems to make them even more tender. Next whisk together 1-egg and about 1/4 cup of milk. Now we'll make a dredge. Place 1-cup of yellow cornmeal in a bowl, and place to your left. Set the bowl with egg and milk directly before you. And place a third bowl with 1-cup all-purpose flour to your right. 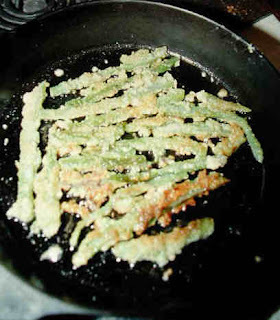 Using a large, cast-iron skillet, place about 3-4 tablespoons of good shortening in the pan over medium-high heat [Mama always used lard, but since folks seldom ever use that any more, you can substitute with vegetable shortening or oil if desired]. Place the poke stem in the skillet and repeat with remaining stems until all have been dredged and are in the skillet. Allow poke to fry over medium-high heat until stems are lightly browned and crispy on the outside and soft and tender on the inside. They have a somewhat "okra-like" flavor. Salt and pepper as desired. Kids enjoy this because it is crispy on the outside. I have always loved this, because it was something that we got directly from the edges of the woods surrounding our home, directly from nature. And it was FREE!!! This pairs especially well with fresh caught trout! Add some hush puppies to the side... and you've got a meal that is absolutely out of this world!!! This serene view is seen from the entrance to the Bean Family Cemetery, which lies across a large field and the single lane road from the Bean Family Homestead, shown here. This view never fails to stir me as I stand where my ancestors settled, built a lasting home - as testified to by the home that remains - and were finally layed to rest where I stand. William Bean was a resilient and resourceful man who raised himself from an orphan and indentured servant, to a man of considerable wealth and means. He is the rock upon which our family stands with great pride. The Old Bean Homestead as seen from across the road at the Bean Family Cemetery.